How to use the top menu? What are country groups and regions? How to print the results? principle applies to group categories, such as regions, developed/developing countries and the world total. The votes from each country are given equal weight when calculating the average percentages. 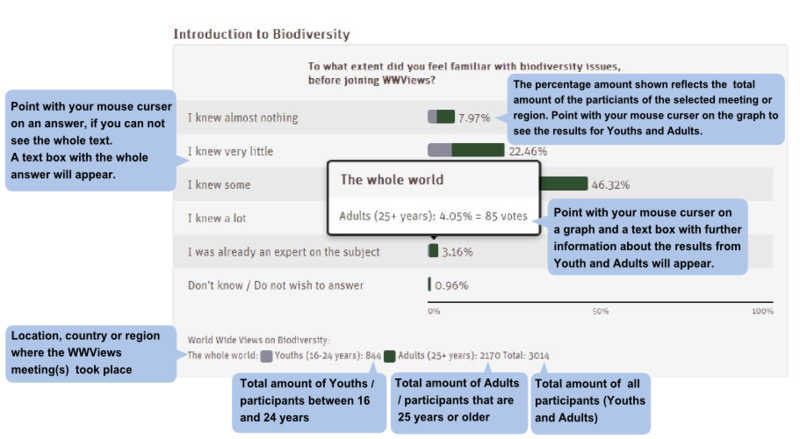 At the online result page, comparisons are available between different WWViews meetings, countries, regions and other groupings. The total number of votes is listed for each answering option, and also available here, is a break out of young and adult votes. In total, there were 839 participants between 16 and 24 years of age and 2,165 participants aged 25 or older. The 34 citizen meetings are grouped into countries (25), regions and other groups of countries that can be compared which each other. Regions and country groups are based on the categories used by the United Nations Statistics Division (August 2012). 4. Scroll down to the end of the page and click on ‘print’ to send the document to a printer or a pdf-creator. Please supply as much information about the issue and its circumstances as possible. Thank you.